Having tripped myself up on multiple occasions setting this up, I’m recording these config steps here for future-me. Scenario: You have a PHP site running on a remote [Ubuntu 12.04] server, and want to connect your local IDE [Netbeans] to the Xdebug running on that server over a SSH tunnel. The key is that your Netbeans IDE acts as the server in this scenario, listening for incoming connections to port 9000 from the remote server’s XDebug. Thus the tunnel must be from the remote port to your local port, not the other way around. Hurrah! 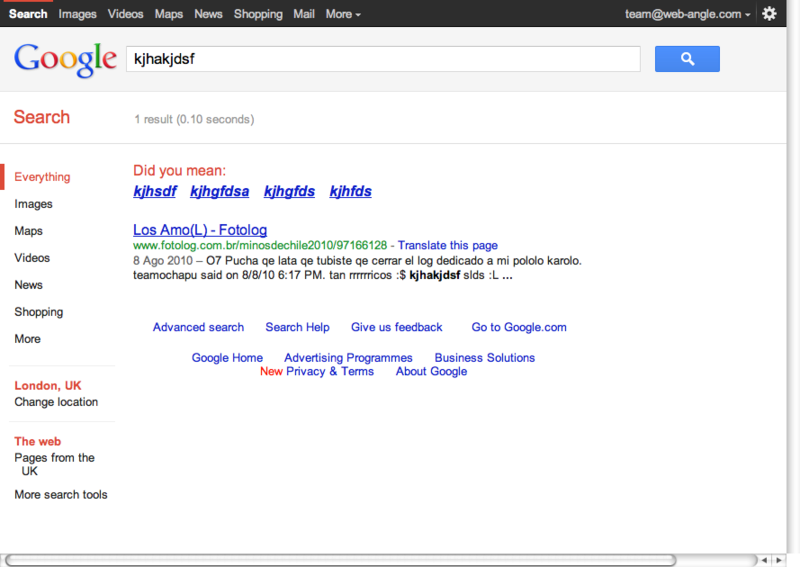 My first googlewack, discovered by complete accident. This makes sense is you consider that good engineering practises are the first to leave the building under pressure to finish, and most teams will revert to quick & dirty hacks to get things implemented, without complete testing etc. My personal opinion is that the only way to shorted development cycles is to reduce the feature set. Its pleasing for me to see that the research seems to back this up. When deciding which features will be dropped; I think its worth revisiting the business requirements that are driving a particular set of features. In many cases a simpler “design” could suffice; for example a fancy calendar widget could be replaced with a simple textbox; a little used settings screen could be retired in favour of manually changing config files; or overly complex but little used workflows could be put on the back burner. I maintain that a lot of “features” can be dropped, without actually impairing the business functionality of the system. Just remember, what every you do DON’T consider dropping testing or QA in an effort to meet your deadline; unless you want to guarantee that you will continue to miss all future deadlines until the project gets cancelled! Wow. DDD, the community conference for UK MS developers, hosted by Microsoft, but completly driven by the community continues to go from strength to strength. This year, the 400 places were filled within 4 hours of this annoucement that registration was open via twitter. I really enjoyed Mike Hadlow‘s talk on IOC injection; with specific reference to his opensource eCommerce application, SutekiShop. Clearly an expert on the subject on ASP.NET MVC, Onion architecture, Repositories & Services, and binding it all together with IOC; he is also a gifted presenter. If you’re looking for a reference implementation of an ASP.NET MVC application (or indeed just a loosely coupled, TDD driven web application); I’d strongly advise you to check out Mike’s SVN repo. Toby Henderson gave an interesting demo of how you can run .NET apps under Linux (Ubuntu) using Mono. Worth bearing in mind when considering your hosting & deployment options. Tired of always checking if your event delegates are null before calling them? Just declare them with a standard empty delegate. Then they are never null! As always it was a great event – remember, if you want to be at DDD8 (2009); sign up early! I propose that one of the principal things that gets projects into trouble is too much complexity. My theory is that there are a number of “complexity smells” that if identified and addressed early on can radically improve a projects chances of success. To explore this theory, I recently ran a workshop where we brainstormed complexity smells and possible preventative actions. Do you really need all those features? Should you really be introducing this code abstraction or design pattern; or are you just speculating that it will be required in the future? Will a simpler solution work for now? a) Do you really need that functionality / code. No really. Is your unit test coverage above 80%? Can you click one button and have all your acceptance tests run automatically? Have you considered that any change made after version 1 is released (aka, in 90% of the lifecycle of the application!) is the equivalent of someone opening a novel they have never read, changing what happens to a couple of characters, and then without re-reading the novel; hoping it all still makes sense. Does your project have a clearly prioritised backlog? When new features are introduced, is it easy to see which features should be moved down the priority list. How frequent are your feedback loops – between deciding on a requirement, designing a feature and getting feedback on whether that implemented feature fulfils the requirements? (b) Appoint a strong product backlog owner. Who owns the projects feature set? Who owns the code past release 1? Is there someone who can made decisions quickly and decisively? (a) Customer should decide what is produced, and what acceptance tests validate that it works. If your project is exhibiting some of these smells; perhaps its time to have a complexity retrospective with your team and nip them in the bud before they spiral out of control and kill your project. Many projects go awry due to excessive complexity; and its always worth evaluating whether your team is approaching things in the simplest way that can work; especially when the deadlines begin to loom. I recently lead a retrospective with my team focusing on complexity across all the areas of our project, using the a handful of techniques from “Agile Retrospectives – making good teams great” (a must have for every agile team). 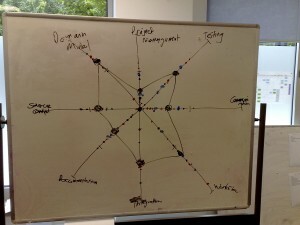 I then told the team that in this retrospective we would be considering complexity, and whether we had too much, or just the right amount in each of the areas of our project. To generate insights we used the 5 whys excersize. I asked people to break into groups of 2, preferably cross discipline, and assigned each group 2 of the high ranking spokes. They were then tasked with asking each other “why is <spoke area> complex”, and “why is <answer>?” and so on, until 5 why’s had been asked. The answer to the 5th why was considered the root cause of the complexity, and recorded on a card. As the root causes cards came in, I grouped them, and when everyone was done, read the root cause groups out. To decide what to do we constructed 2 more histograms, one considering the risk of the root cause, and the other difficulty to address the root cause. I then ask each person to vote which of the 2 root causes had had the highest impact & and which was the least difficult to address. This produced the following histograms. 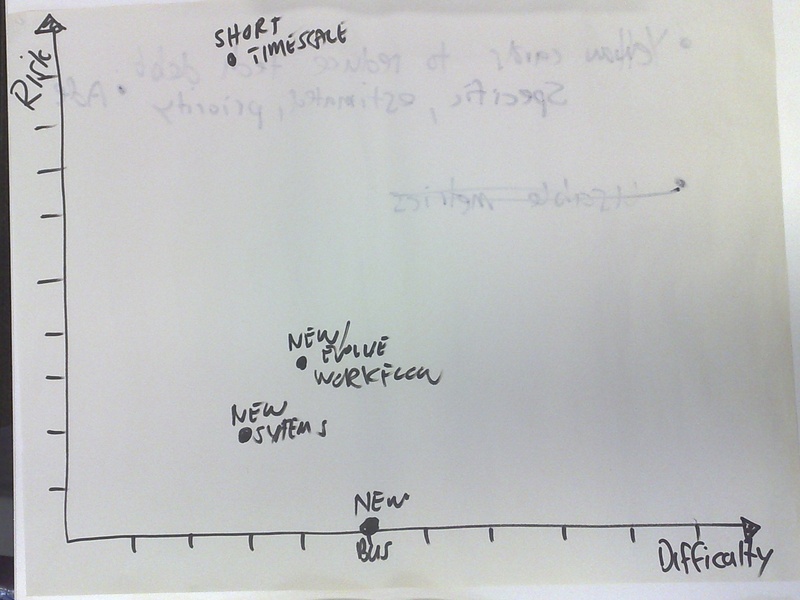 My intention was that the final exercise would make it simple to choose the actions to take forward for the next sprint (basically chose the low hanging fruit – the easiest things to address which had the biggest risk reduction); but there wasn’t a clear winner shown on the graph. Generating actions took a bit more discussion. We found that this format was a fun and effective way to address the complexity problem. Hopefully you’ll find running something similar with your own team helpful! 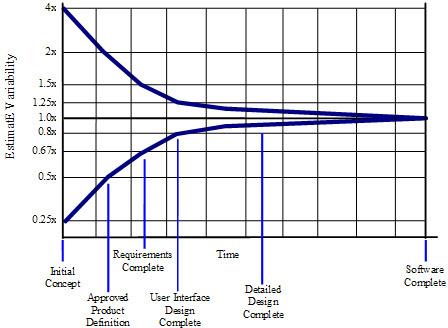 Software estimation’s “Code of Uncertainty” suggests that before the requirements & user interface design is completed on a software project, time to complete the project can vary by up to 16x. Given this research what are the chances of a fixed price bid coming in on time or on budget? Virtually zero. And what is the first thing to slip under schedule pressure – quality. Work delivered closer to the delivery date will be of low quality. What have your experiences been? One of the ideas many people seem to struggle with in Agile projects is that of Story Points. In an agile project, the time to implement a story (a feature), is deliberately estimated in a weird unit called story points, rather than in number of hours / days. The most important thing to remember is that story points do NOT equal units of time. Initially you will naturally find yourself trying to convert story points to days, or estimating in days or hours, and then trying to convert that to story points. RESIST this temptation! There is a method behind the madness. Days are a very subjective unit of measure. Depending on other commitments, your ideal days are very different from mine. With a new project its impossible to know how quickly features will be produced. There are just too many variables – learning of the domain & toolset, agreement within the team, stabilizing of work patterns. What you do is complete a couple of iterations, and then measure how many story points you delivered on average. 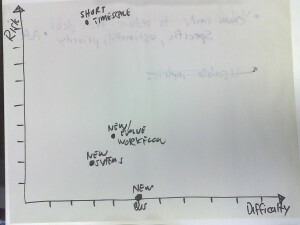 This then becomes your velocity, which you can use to derive an estimated completion range based on the story points. Note that with this technique your story points are still valid; as they are just measures of relative size/complexity. The only time you really need to re-estimate story points is when you got the relative size of a story wrong – perhaps it turns out to be much easier to send emails than you thought, or much harder to draw graphs. The quest to make our world a little greener is a worthy challenge, putting one in opposition with seemingly everyone in our modern society. Case in point – I attended the Geek Kyoto conference in Camden a few weeks back, and rather than drive home on the Friday and then back into London on the Saterday (a round trip of 80 miles), I elected to spend the night in a London hotel. Finding parking overnight was, shall we say, trying, and wildly expensive. Egad – I managed to pay £10 for the pivilege of being fined £120. So much for attempting to reduce my CO2 footprint by driving less!